Dreams of conquering a four-star course or cruising around a show ring aboard a stylish, square-kneed hunter, ending the day with a plethora of blue ribbons, are familiar for many equestrians. Of course, the ribbons and glory came from spotting the perfect diamond in the rough—a strikingly beautiful Thoroughbred who just didn't want to run and was retired sound and ready to jump into a new career—and then doing an exceptional training job to unlock the horse's full potential. While dreams fuel the hard work of equine sports, a healthy dose of reality is necessary to help our equine athletes. Being honest with yourself about expectations and knowing what a horse can realisticly accomplish off the track is key to a successful partnership down the road. Caught in the middle of trying to temper those expectations and move horses into new homes are aftercare organizations, who (along with other OTTB rehomers/retrainers) have the tough job of taking a horse off the track in whatever condition it may be in and starting it in a new, unfamiliar job. That's why riders in search of an OTTB shouldn't automatically disqualify horses with previous racing injuries. "Many riders have great expectations, which is wonderful, but in reality very few will gallop around Rolex," said Sarah Coleman, director of education and development at New Vocations Racehorse Adoption Program. "We do have people who want an unblemished, perfect horse—and those are very hard to come by. Every New Vocations employee works diligently to educate riders and trainers about past injuries from which the horses have been rehabbed. An old bow most likely will not affect a three-foot hunter, but it might aggravate a two-star (event) horse," she said, adding that New Vocations aims to match riders' experience, expectations, and wants before they ever show up to their facility. Signal Hill had a tendon injury when he came to New Vocations but is now successful in a hunter/jumper career. Photo courtesy of New Vocations. 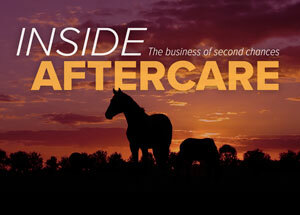 Since many runners are not retired from the racetrack until they have a career-ending injury, taking in injured horses and rehabbing them is a reality for aftercare organizations that adopt out horses. "Taking on rehab horses is an expensive, yet absolutely necessary, endeavor," Coleman said. 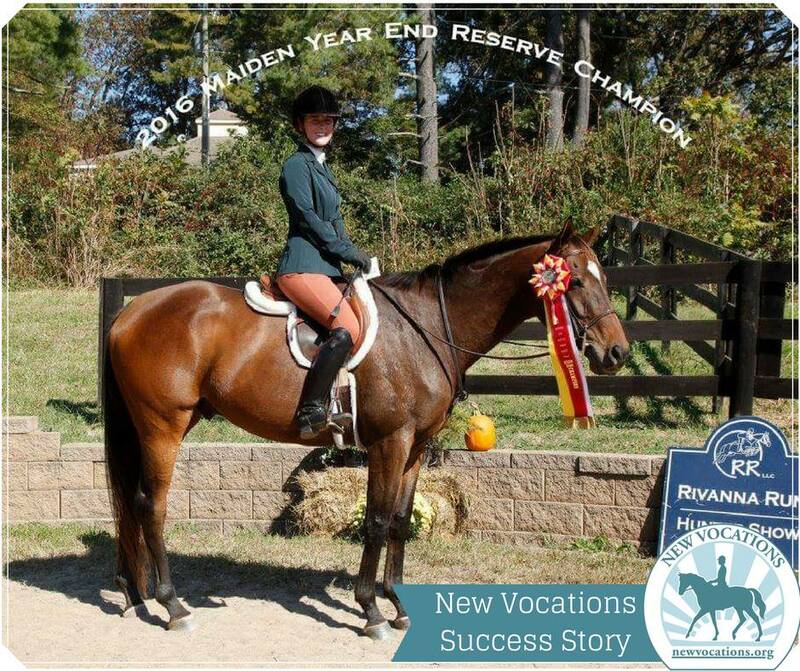 "New Vocations focuses on adoption, not retirement, believing that every horse that is capable deserves a chance at a second career and a home. We take horses into our program that are either sound or have a good prognosis of being sound with rehab. "Well over 50% of the horses that come into our program need some form of rehabilitation, whether to mentally or physically recover from the rigors of racing." Taking in approximately 450 horses a year—all going straight from the track into one of their facilities—with an average cost per horse in the program of $3,500 (depending on injuries) adds up. The organization has training facilities (the three for Thoroughbreds are in Lexington, Marysville, Ohio, and Hummelstown, Pa.) and rehab-specific facilities. Their staff works closely with veterinarians to determine the extent of horses' injuries, and plan rehab and training based on the horses' suitability for a new career. They also disclose any information to potential buyers, and encourage serious buyers to do pre-purchase exams. 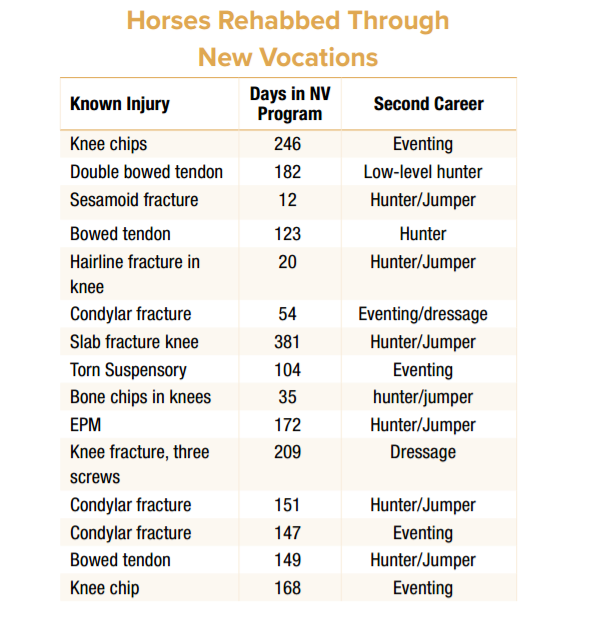 While every horse is different, New Vocations has seen a number of horses have injuries that have ended their racing careers go on to be sound and suitable mounts in other disciplines. "Many times, if (potential buyers) hear from us and a vet that an old injury will not impede the horse in the intended career, they are more likely to look at the horse," Coleman said. "We remind them that we all have old injuries that we heal from, and the horses are not any different. Unless it is an upper-level eventer, the physical rigors placed on them will never be as great as when they are racing."